Asetena.com has come across a document purporting to be what panellists at the NABCO Interview are using to assess applicants. Although there has not been any formal confirmations from NABCO, those who attended today interviews today have confirmed they were asked those questions. What do you know about NABCO? You applied for (your chosen module). Why this module? What do you expect to gain out of this temporary role? What has your Job Search Experience been like? 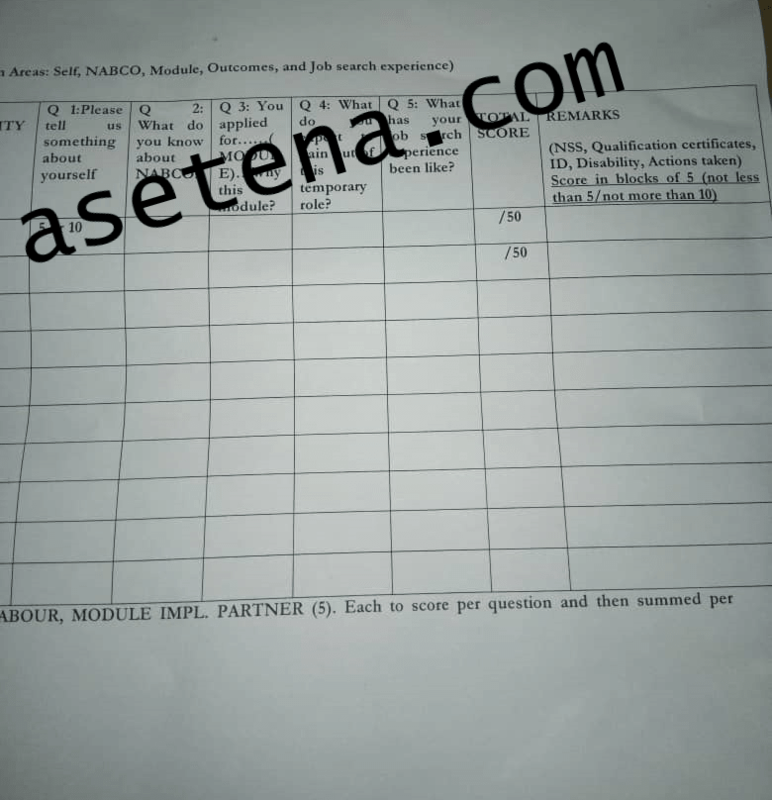 As you can see from the Document Above, the areas that NABCO seeks to assess are the applicant’s self, His/her knowledge on the chosen module, What they expect to be the outcome of their work at NABCO, should they be selected, and their general job search experience. Also, there seems to be a general check of qualifications with include NSS, Degree/Diploma Certificates, A Government Issued ID Card and some physical peculiarities. The panellist members will consist of officials from the National Service Secretariat, Metropolitan, Municipal and District Assembly (MMDA), NABCO, LABOUR and Module Implementation Partner. Therefore there should be at least 5 people on the panel. My name is Francis Babadie. I graduated from the Kwame Nkrumah University of Science and Technology with a second class lower division in 2015. Between that time and now, I have successfully completed my National Service, where I served as the District NASPA Secretary. I possess a strong sense of dedication to every work I do and I am mostly passionate about my country Ghana, and helping it to become better. This question seeks to find out how much you know about the programme. Government is seeking to employ 100,000 graduates in solving public service delivery in health, education, agriculture, technology, governance and drive revenue mobilization and collection. All trainees will be paid a monthly stipend of GHS 700. Tell the interviewer you have a passion for the module and want to work there because you also have the skills. Example: As a young person, I have always wanted to be a doctor but due to financial constraints, I couldn’t take up that field of study. My main aim in life is to help people, especially the sick and that was why I went to the Pantang Nursing Training School. As I am currently not working, I can’t realise that aim of helping people, so choosing Heal Ghana Module has given me the chance to do what I have always loved and studied for – to nurse and care for people. Let them know you are not in for the money but for skills as well. From the NABCO website, it is clear that the programme will take 3 years. I also understand that during the time, I will gain skills and experience, and I am very interested in getting those, especially as I look forward to getting fully employed in the future. Be truthful and tell them about some problems you faced while getting employed if any. After completing the University of Ghana, I had my National Service in the Central Region. It has been difficult getting a job even though I adopted both online and offline searches. Therefore, when I heard about NABCO, I decided to apply as I will not only be working, but I will also gain skills.